Spent yesterday afternoon constructing my the first baragoni, or upper sleeve, for my Bacchiacca gown. For once I also took step by step photos. I used a sleeve pattern I made a while back for the green Carpi gown. The lining is cut to a fitting size, and the velvet is cut two times as wide and three times as tall. 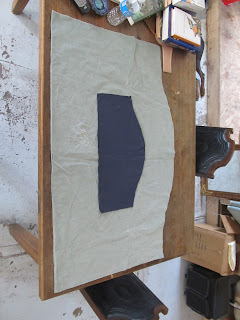 I then marked three evenly space lines from side to side on both the lining and the velvet. On the lining, I cut three strips of bias tape to the correct, finished width. On the top and bottom edges, I folded the velvet in about a half inch before putting in the gathering stitches. Then I pinned the pre-cut pieces of bias tape to the velvet, along the lines, and gathered to fit. I then stitched the bias tape to the velvet, going through the gather at the top of the bias tape, and then through the bottom. The stitches are almost invisible on the right side. Again, I kept my stitches as invisible as possible, running the majority of my thread between the layers to keep it hidden. I started the stitch lines about an inch from the edges so that I would still have wiggle room to finish the seam. And then pinned the edges of the velvet right side together and hand sewed the seam with about a 1/2 inch seam allowance.